Roasted Concord Grape Cocktail | Good. Food. Stories. October isn’t just decorative gourd season, motherf*&kers. It’s Concord grape season, and you know what that means? I want to embrace the fall season, my favorite season, but the world continues to conspire against me. World, let’s negotiate. Even if it seems too warmly out-of-season to start braising short ribs and baking pot pies, it’s never the wrong time to make a drink. How about some grape-on-grape action with a roasted Concord grape cocktail? It’s Concord Thyme! While you can definitely eat Concord grapes off the vine (taking care to spit out the enormous seeds, of course), I feel that they show off their best stuff when they’re cooked. Their grapeyness intensifies and distills itself into the sweetest essence, with the most perfect color to complement. 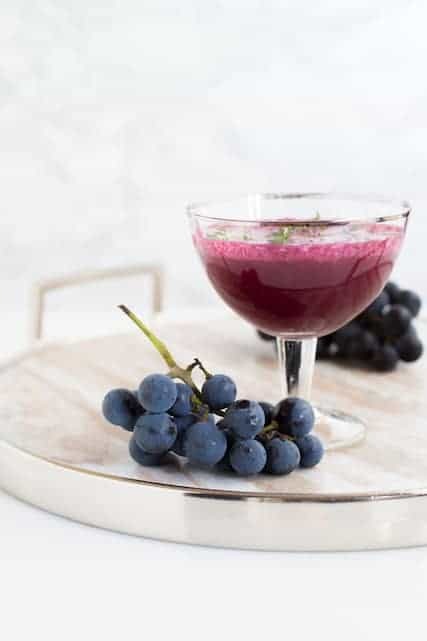 That’s why, instead of just throwing a bunch of fresh grapes in the blender, this drink uses a base of roasted Concord grape puree. Yes, the process takes more time, but in my humble, Concord-obsessed opinion, the final effect is superior for both the tastebuds and the eyes. And in the spirit of this weirdly amalgamated holiday conglomeration that we have accepted as the new normal, the Concord Thyme can adapt to whatever cocktail situation you have on deck in the coming month. Drink it now, in October, as a way to herald the arrival of fall and the best month of the year. Serve this Concord grape cocktail as a Thanksgiving welcome; it’ll complement the pre-meal appetizers without weighing guests down with too much hard liquor and ABV. 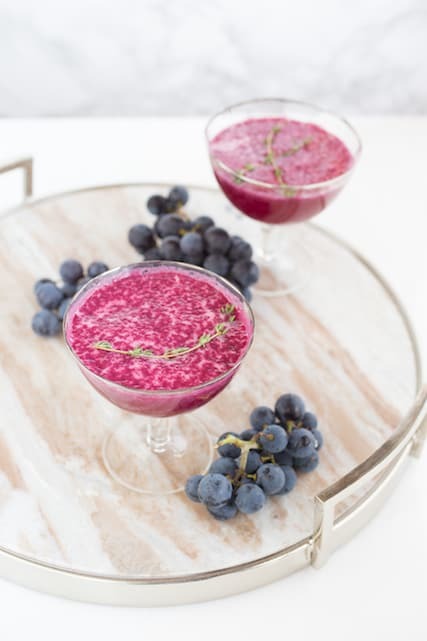 Or bring it out as a signature cocktail in December for your holiday party—if you’re the planning sort, as I am, you can double or triple the base puree recipe now, while you can still find Concord grapes at the market, and freeze until needed. 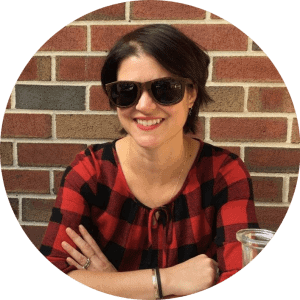 Oh, and one prep caveat for those who haven’t worked with Concords before! 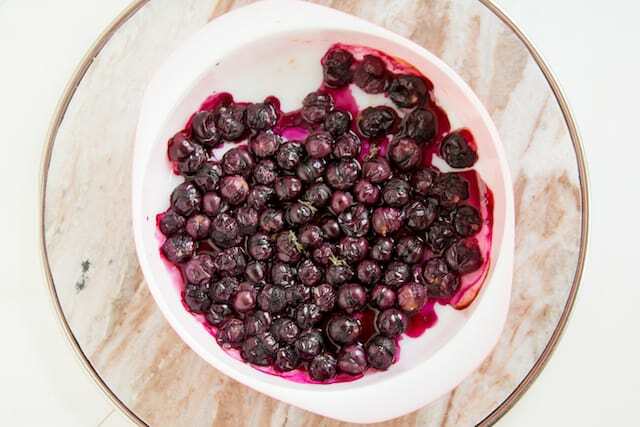 While raw Concord grapes can be plucked and squeezed with no staining consequence, cooked Concord grapes are stain monsters of the highest degree. (Seriously, they must have conferences with roasted beets about the best ways to wreak havoc.) Drops of the grape puree will most certainly leave a mark on your marble counters or anything else the liquid comes into contact with, so take care. Or have the Soft Scrub at the ready. Preheat the oven to 400 degrees F for the grapes. While the oven comes to temperature, add the sugar, water, and 3-4 whole thyme sprigs to a small saucepan. Bring to a simmer over medium heat, stirring frequently, until the sugar is completely dissolved and the liquid is clear. Cover and steep for 30 minutes. Place the grapes in a nonstick baking pan or casserole dish, or on a rimmed baking sheet lined with parchment paper. Drizzle with maple syrup and sprinkle with the leaves from 3-4 additional thyme sprigs. Roast for about 15 minutes, until the grape skins are cracking and separating, and the grapes start to release their juices. Place a fine mesh strainer over a bowl or large liquid measuring cup. With a silicone spatula, scrape the grapes and any syrupy liquid from the pan into the strainer. Stir and press the grapes to break them down and release their juice, leaving the skins and seeds in the strainer. You’ll have about 1/2 cup grape puree. Clean the strainer and re-strain the puree to remove the fine bits of grape particulate. I know, it seems nitpicky, but the double-strain means you’ll have a prettier drink without any blobs of sediment clinging to the side of your cocktail glass. Pour 3 tablespoons puree into each of 4 chilled coupe glasses. Add about 1/4 cup sparkling wine to each glass. Garnish with a thyme sprig and serve immediately.